The chances of a major hurricane happening this year have dropped dramatically, federal forecasters said on Thursday. That upbeat revised prediction comes just as the Atlantic hurricane season typically heats up, with August, September and October historically producing the most and strongest storms. Full news release from NOAA here. Also read more at the Miami Herald, ABC News, and TCPalm. Publix CEO Todd Jones at the St. Petersburg Free Clinic on Thursday, August 9., 2018. 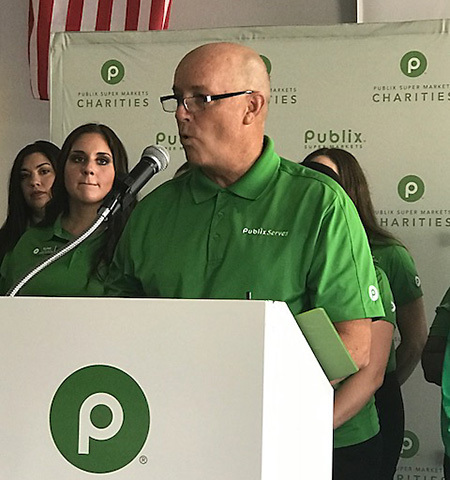 On Thursday, Publix Super Markets Charities began distributing $5 million to more than 240 nonprofit organizations, including Feeding America® member food banks, focused on alleviating hunger across Publix’s operating area. Publix CEO Todd Jones personally visited many of the charities and handed out checks. The donation will provide funding to assist in the nourishment of children, seniors and families in need. This news release lists many of the recipient charities, including eight in Florida. Publix is the largest private comany based in Florida. Economic incentives are on the agenda next week for the Broward and Palm Beach county commissions. Both groups are conducting meetings to discuss incentives for companies that are considering relocating elsewhere. Winter Park could limit new restaurants at its popular downtown district in an attempt to solve a parking-space crunch. City officials have been trying to address parking problems on Park Avenue for years as Winter Park businesses, residents and visitors complain about a lack of parking spots. With two months left in its budget year, Visit Tampa Bay said Hillsborough hotels have collected $29.1 million, which is nearly as much as in all of 2016. So far, hotel bed taxes — a 5 percent surcharge on overnight stays — have set records in nine out of 10 months so far during this fiscal year.